My recent series “A Civil War Between the Church and the Gay Community?” (Part One, Two, and Three) has involved a discussion of the church’s relationship to the state, with some special attention paid to the current debates over homosexuality and marriage. During that discussion, I made the assertion that when the church that looks to the government to enforce its wishes, it declares its spiritual bankruptcy. This is a difficult statement, and one that I think needs further exploration, especially in light of the church’s important historical role as an agent of change in pushing for greater justice. As Jay Woodham rightly observed in a comment on Part Three of that series, William Wilberforce, Martin Luther King, Jr., and numerous others serve as great examples of Christians who succeeded in bringing about positive changes in their societies through putting pressure on the state to enact more just legislation. How then can my statement about how the church must not look to the government to enforce its wishes be reconciled with such sterling examples of what appears to be the opposite? Help the state be the state. Question the state regarding its actions and their legitimacy to help the state be as God ordained. Aid the victims of state action. The church has an unconditional obligation to the victims of any ordering of society—even if they do not belong to the Christian community. When the existence of the church is threatened and the state ceases to exist as defined by God, it is not enough to bandage the victims under the wheel, but to put a spike in the wheel itself. One thing that is immediately evident from Bonhoeffer’s guidelines is that he makes a clear distinction between the church and the state—perhaps the single largest point I tried to emphasize in my three part series. The church’s ultimate responsibility is to bring transformation from the inside out, not from the top down. But this does include the need (as I indicated in Part Two) for the church to act as a check upon the government, advocating justice and putting pressure upon the government where it falls short of justice. How then is this responsibility to act as a check upon the government any different from trying to “legislate morality,” which I warned against? Well, on the face of things, it’s not different from legislating morality. But the distinction I’m trying to make is between the church influencing secular society towards greater justice on the one hand and using political clout to enact specifically Christian laws at the secular level on the other. The point is that the church should seek to change the heart of the culture through influence gained by example, service, proclamation, and advocacy rather than trying to impose outside restrictions on a people who do not already embrace the principles underlying them. Any attempt to enact fundamentally Christian legislation at odds with the values of the secular populace is evidence that the church is going about things the wrong way. If a moral critical mass has not been achieved at the grassroots level, no amount of legislation is going to bring about the desired change without devolving into an instrument of oppression itself. This distinction can get messy, especially in a society where the majority of public leaders are themselves Christians and (at least nominal) Christian belief is more widely spread or influential in a society, because then the church is put into a position of greater power. The more “Christian” the society gets, the more the church must be careful to distinguish between itself and society at large—the more secular power the church has access to, the greater the danger of becoming an agent of oppression itself. Put differently: the greater a leadership role the church has in society, the more it must ensure it is operating from the bottom up through service rather than from the top down through legislation and oppressive means—ever applying the “upside-down” Kingdom ethic of the New Testament. The church must always operate through this upside-down Kingdom ethic—otherwise it testifies to its embrace of the world’s way of functioning and thereby bears witness to its own spiritual bankruptcy and abandonment of its Teacher. As for the question of those who, like Wilberforce, are themselves in positions of secular government, individual Christians who are in public positions are obligated to seek greater justice in their own positions, serving as a voice from the church within the government—by no means should they shirk away from pushing for what they believe is a greater justice simply because it is tied to their Christianity. But they must also be cautious of pushing legislation at odds with the ethos of the society, lest their good intentions lead to unintended negative consequences. Wilberforce, King, and the abolition movement serve as great examples of what can happen when critical mass is finally reached and the society at large begins to recognize (and hate) injustice. The church’s role (and this is shared by Christian public representatives) is to draw attention to these injustices in order that the outcry for change is such that the new legislation reflects the changed heart of the people. So, returning to Bonhoeffer’s guidelines, on the first level of interaction, the church is operating as a voice and influence. At this level, it is the responsibility of the church to call attention to injustice and push for greater justice; this responsibility starts with the church’s responsibility to proclaim and persuade, not with efforts to intervene in matters of the state. And—because a church that recognizes its distinction from the state will always understand the difference between legal and moral—the church should always be in a position to call for greater justice. The next level of interaction calls for organized church action to amend for injustices perpetrated by the state and look after the powerless and downtrodden. This is a step all too often given short shrift in churches within the USA, left behind in the charge to change the law. In Bonhoeffer’s day, this step was dramatically performed by those (like Bonhoeffer’s family, the ten Boom family, and countless others) who sheltered, protected, and transported Jews to safety in the midst of the Holocaust. Today in the USA, practical examples of these steps might be churches establishing training and work programs for the unemployed, streamlined (and generously church-funded) adoption programs as a practical alternative for abortion, provision and lodging for young unwed mothers, etc. The point is that there will always be injustices within a society—it is the church’s responsibility not only to call attention to injustice in such cases but also to go about healing the injustice. 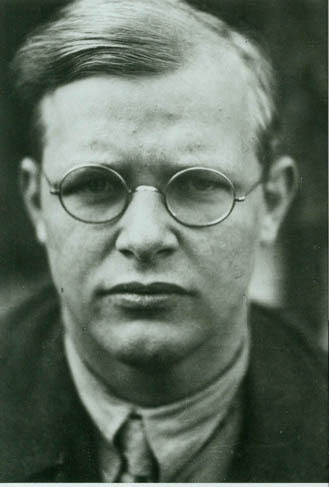 Bonhoeffer’s third level of interaction is, of course, what led to his execution at the hand of the Nazis—once the state threatens the existence of the church and the state is no longer performing its function as the keeper of social order and protector of justice, the church is responsible to aid in toppling that regime. This is a significantly more debatable point, as many Christians behind the Iron Curtain chose simply to meet “underground” as opposed to attempting to overthrow the government through violent or revolutionary means. Though I’m not sure this option should be dismissed out of hand, I tend towards the idea that the church’s responsibility in such cases is found in prayer and martyrdom rather than in violent resistance, even in the midst of a tyrannical and oppressive government. To sum up, my contention is that the church must never look to the government to do the church’s job. The church is ever responsible to advocate and seek justice, but its primary responsibility is to the hearts of the people, not to the legislation of the state. If the church distinguishes itself from the world in action and word, its influence will inevitably reach the state, but if it seeks to influence hearts through the state, the church has forsaken the upside-down ethic of its Teacher, has forfeited its spiritual power, and will become instead an agent of oppression. As such, the church must always understand its place as salt within the cultural stew—it is not the stew itself—and seek to set the example before the world of what true justice looks like. Was just looking for some quotes by Bonhoeffer and came across your really excellent article – strongly agree with most if not all of it. I’m currently doing a bit of writing about the role of Christian action within the context of, or as an alternative to, the ‘welfare state’ as we call it in the UK. Is this something you’re interested in at all – if so let me know I’d really welcome any comments. I’m always interested in that sort of question. I’ll be interested to see what you come to. Break that down to where I could understand and apply will you. let’s say I am a resident and a church leader in E Germany during WWII. I am a church pastor, I hate what is happening to my neighbors and friends. They are being destained and hauled off as criminals without any trial to be murdered. What exactly areyou saying I and my congregation are to be doing? Oh and Hitler is shutting down all clergy that opose Him ? That’s pretty much the dilemma Bonhöffer was facing. He ultimately decided to join in a plot to assassinate Hitler, though he was not comfortable with that decision. In other times and places where Christians have been similarly persecuted and killed, they have often chosen to pray and bear testimony before those who see the injustice but to go willingly to their deaths, confident that their blood would play a role in bringing about justice when God chose to act.